As grid outages become more common, there is a growing desire for solar electric systems that provide power during utility power outages. 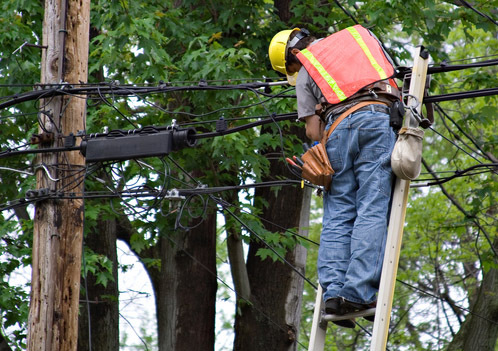 For the safety of line workers, grid-tied solar electric systems must not feed power back into the utility lines during an outage. Batteryless inverters simply shut down when the power goes out. Grid-tied battery based inverters include a transfer switch to isolate them from the grid and use a battery bank to supply power to loads designated for backup and connected to a separate output from the inverter. There are several ways to design and deploy inverters with backup capability. Means of connecting the backup loads to the system can range from simple to complex. Backup power can be arranged for longer or shorter times depending on the loads and battery bank capacity. The most common arrangement for grid-tied solar with backup is where the PV array powers a DC charge controller to charge a battery bank. Whenever the battery is fully charged, the voltage rises to a set point and any power available over that voltage is available for use. The inverter output is connected to both the backup (aka critical loads) subpanel, and to the grid intertie in the main electrical panel. Under normal conditions, it functions like any other net metered inverter. During an outage, an automatic transfer switch in the inverter opens the grid interconnect, isolating the building from the utility to prevent back-feeding the local power lines. The inverter then draws from the battery bank to provide AC power to the backup subpanel. The term “DC coupled” has only come into use recently to distinguish this configuration from “AC coupled” which is a newer arrangement that has come into use. When starting from scratch, a DC coupled system is typically the most cost-effective and reliable configuration to use. Note however, that the PV array is not managed by the inverter, but by the charge controllers, many of which are limited to 150 VDC input. Inverters that can be used for DC coupled grid tied systems include the OutBack GVFX, GTFX, and GS (Radian) series, the Schneider Electric XW series, and the SMA Sunny Island series . Any charge controller can be used with a DC coupled system so long as it is compatible with the solar array and the battery . 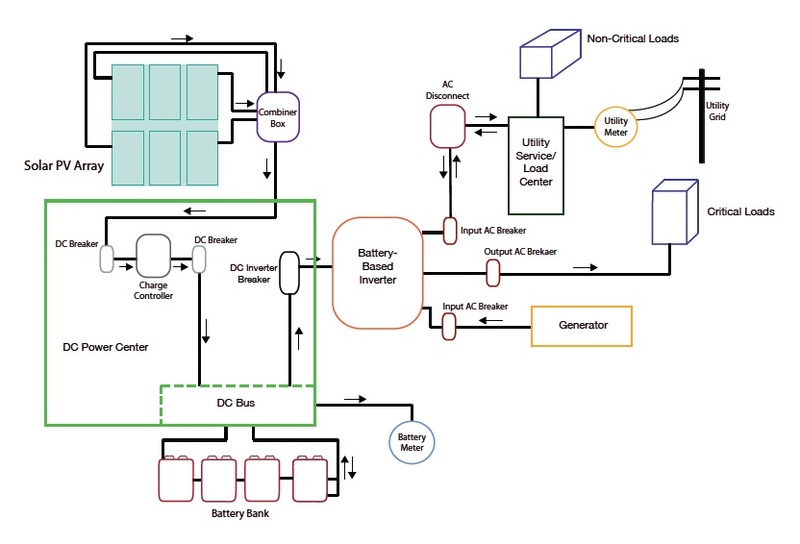 In an “AC coupled” system, a batteryless grid-tie inverter is connected to the solar array, while a battery based inverter is used to produce power from the battery bank during a utility outage. In this configuration, the AC output of the grid-tie inverter is connected to the backup (aka critical loads) subpanel rather than the building’s main panel. The backup subpanel is also connected to the AC output of the battery inverter. The AC input of the battery inverter is then connected to the main panel as in a DC coupled system. Under normal conditions, the batteryless grid-tie inverter is passed through the battery based inverter’s built-in transfer switch, to the main panel and utility intertie, without loss of efficiency. Likewise, grid power can pass the other direction when needed to power the loads in the backup subpanel. 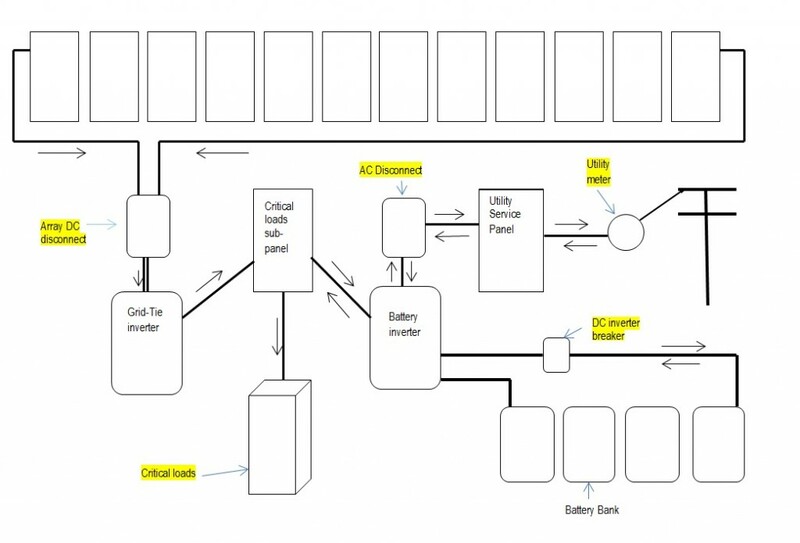 During a power outage, the battery inverter’s transfer switch isolates itself from the utility connection and provides AC power to the backup subpanel, drawing energy from the battery bank. The batteryless grid-tie inverter will shut down at the start of a blackout, but will turn back on (after a mandatory 5-minute waiting period) when AC power from the battery inverter is detected and supply AC power to the backup subpanel, and if enough power is available, will be used by the battery inverter to charge the batteries. Note that once the battery bank is fully charged and the loads are served, the batteryless grid-tie inverter will need to be throttled back, diverted or shut down in order to prevent damage to the batteries. An AC coupled system offers a few advantages compared to the traditional DC coupled system. The batteryless grid-tie inverter can use the higher voltage from the solar array, reducing the required wire size, and is generally more efficient than a battery based inverter. Additionally, if a direct gird-tie system is already installed and battery backup is added later, it is often more convenient and cost effective to leave the existing system in place. Countering the advantages, AC coupled systems are typically much more expensive and complex to design and only certain inverter technologies can be used in such systems. Currently the SMA Sunny Island is the only equipment specifically made to be AC coupled (with SMA Sunny Boy inverters) and is fully factory supported. With the exception of high frequency inverters, such as Fronius IG Plus and SMA SunnyBoy HF, most batteryless grid-tie inverter can be made to work in an AC coupled mode. However, most manufacturers cannot provide adequate technical support, and some warranties will become void if the inverter is AC coupled. It’s wise to check first before designing a system. SMA, OutBack, Schneider Electric, and Magnum all make battery based inverters that can be used in an AC coupled configuration. The SMA Sunny Boy 3000TL-US/4000TL-US/5000TL-US line of inverters has an Emergency Power Supply option. During a power outage, so long as the sun is shining, power is available from a separate switchable circuit on the inverter at up to 12A at 120 VAC. This works well to recharge cell phones, laptop computers and other appliances with built in batteries, or add your own UPS (Uninterruptible Power Supply) for continuous power when the clouds go over or the sun goes down. It is, of course, possible to have a battery backup system that is separate from the solar grid-tied system. In parts of the world with frequent short outages, many people just install a battery based inverter and battery bank without any PV whatsoever. Similar to a UPS, the battery is kept charged by the inverter from the utility AC power, and during a power outage will supply power from the battery to AC loads. This type of system has no way of being recharged during an outage. The most common and accepted method of connecting backup loads is through a backup subpanel that serves specific circuits. The backup subpanel is typically installed next to the main panel so that the circuit wiring can be easily transferred from the main panel to the subpanel. These circuits are then automatically powered through the backup system during a utility outage. Note that only complete circuits can be wired this way, not individual appliances. Appliances can occasionally be moved from other circuits onto a backed up circuit or loads can be moved off of backed up circuits if they are not needed during an outage. If it helpful for the end user, unique styles or colors of receptacles can be installed on backed-up circuits. It is possible to have a backup system power an entire home or building if either the backup system is very large or the loads are unusually low. This is not often done because it requires a backup system large enough to power all loads in the house. Otherwise, the loads running when the outage occurs may overload the inverter, effectively defeating the backup system’s purpose. It also introduces technical and potential legal complexities as a larger transfer switch and line side tap are typically required. For a grid-tied battery based system, the sizing of the solar array is much the same as sizing it for a non-battery grid-tie system. The limitations on the solar array are still: avialable installation area, maximum offset of utility power, and budget. Often a solar array sized for grid-tie will be more than large enough during a power outage. For AC coupled systems, the battery based inverter typically needs to be larger than the batteryless grid-tie inverter for best results. The battery bank size is determined by the length of time and the size of the loads to be run during an outage. Backup systems can be made to supply power for minutes, hours, or days. If outages are brief or if a backup generator is planned, the battery bank only needs to be large enough to carry the loads for a few hours. Most often, a backup time of one half day or multiple days is desired. If there is not much sun, a generator can be run for a few hours per day to keep the battery bank charged. If the system is to be capable of running indefinitely, it should be sized like a true off-grid system. The OutBack GVFX and GTFX inverters are 120 VAC only, but two inverters can be wired in series for 120/240 VAC and up to 7.2 kW of power. Only two of these inverters can be used in one system. If using a single inverter, an autotransformer can be used to create a 120/240 VAC output, if needed. The GVFX and GTFX inverters have only a single AC input that is normally connected to the utility via the main house panel or other intertie point. To use a generator with these inverters during a power outage requires an external transfer switch to connect the inverter AC input to the utility or generator. These inverters’ AC connection parameters are very sensitive and they will not connect to most generators. An inverter based generator, like the Honda eui series, is recommended for use with these inverters. OutBack makes a variety of AC and DC breaker enclosures and accessories for their inverters using their FLEXware system. MidNite Solar also makes E-panels for integration of the OutBack inverters. The OutBack GS Radian 8kW inverter has 120/240 VAC input and output. Multiple GS inverters can be paralleled up to eight units for 80kW capacity. The GS inverter has two AC input circuits, one for the utility connection and one for a backup generator. Both connections are 120/240 VAC. The OutBack GSLC is available for integrating the GS inverters with AC and DC breakers. Many of the FLEXware accessories will also work with GS inverters. GS Radian inverter can be used in a AC coupled systems, but unlike other OutBack inverters, there is no provision to prevent battery overcharging other than using the AUX DC output and a relay to disconnect the batteryless grid-tie inverter when the battery back reaches the maximum voltage. The capacity of the batteryless grid-tie inverter should not exceed 75% of the total battery inverter capacity. The Schneider Electric Conext XW inverters output 120/240 VAC in each unit and up to four inverters can be wired in parallel for up to 24kW of power. The XW inverters have two AC input circuits, one for the utility connection and one for a backup generator. Both connections are 120/240 VAC. Available integration panels and accessories from Schneider Electric and/or MidNite Solar and help simplify design and streamline installation. Conext XW inverters can be used in AC coupled systems, and recent versions include a frequency shift feature for control of the grid-tie inverter for battery charging. When the frequency is shifted out of specification, it causes the grid-tie inverter to drop off line. The capacity of the grid-tie inverter should not exceed 100% of the XW inverter capacity. SMA pioneered AC coupled systems for grid-tie battery backup applications. SMA designs are assumed to be AC coupled using Sunny Boy grid-tie inverters and the Sunny Island for the battery inverter. The SMA Sunny Islandinverters output 120 VAC only, and can be wired in series to make 120/240 VAC power. Up to four Sunny Island inverters can be wired in parallel for up to 24kW of power. The SMA Smartformer, or a similar autotransformer, can be used to make 120/240 VAC output from a single Sunny Island inverter. The Sunny Island will shed the AC loads to prevent battery over-discharge while continuing to charging the battery bank. It also includes a pre-wired AC distribution board with a bypass switch for direct grid operation, as well as circuit breakers and wire terminals. The utility connection for the Sunny Island is 120 VAC only. When using two to four Sunny Island inverters, the AC input and output will be 120/240 VAC and an autotransformer is not needed. The Sunny Island uses frequency shift to control the battery charging from the grid-tie inverter. With most Sunny Boy grid-tie inverters, communication with the Sunny Island inverter will allow for a gradual reduction in power from the Sunny Boy inverter as needed to prevent battery overcharging. Other string inverters will also work with AC coupling, but will shut off and on with frequency shift instead of smoothly backing off the power. New integration panels from MidNite Solar for use with the Sunny Island inverter, include pre-wired and assembled systems to streamline design and installation. The capacity of the Sunny boy inverters can be 200% of the Sunny Island capacity for more flexibility in system sizing and better production on cloudy days or with occasional large loads. When used with a 120/208 VAC three phase system, multiple trios Sunny Island inverters can be assembled into a system using the Multi-cluster box for a system with up to 72 kW capacity. Each group of three Sunny Island inverters will have a separate battery bank. Magnum Energy MS4024PAE and MS4448PAE inverters are not grid-tie inverters on their own and can only be used in a grid-tied system when AC coupled. The grid-tie inverter provides connection to the grid while the Magnum inverter serves the battery backup system. Both of these inverters have 120/240 VAC input and output without a separate transformer. The Magnum inverters have a single AC input that is normally connected to the utility via the main house panel or other intertie point in a grid tied system. To use a generator with these inverters during a power outage requires an external transfer switch to connect the AC input of these inverters to either the utility or the generator. Magnum inverters use frequency shift to protect the battery bank from being overcharged, but they allow higher voltage than is normally recommended for the battery, so should be used only as a secondary control. Primary control can be provided either with a diversion control to burn off excess production into a heater, or by using the auxiliary contacts on the Magnum RTR router to trip a relay taking the grid-tie inverter off line when the battery reaches a set voltage. Magnum makes a variety of AC and DC breaker enclosures and accessories for their inverters to streamline design and installation. 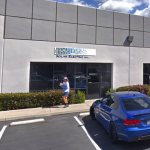 MidNite Solar makes E-panels for integration of the Magnum inverters, and also full systems designed for AC coupling, including pre-wired and assembled systems. The Midnite AC coupled system uses the RTR relay for battery control and is available with the MS4024PAE inverter. The output of the grid-tie inverter should not exceed 90% of the battery inverter capacity. A battery banks are typically 100 Ah or larger. A 48 volt, 100 Ahr battery bank, when adjusted for inverter efficiency and maximum 80% depth of discharge, will provide about 3.5 kWh of energy over a 20 hour period. The battery bank must obviously be sized to serve the loads, but also must be able to accept the highest possible charge current from the PV array if it is not otherwise regulated. Battery banks usually consist of one to three parallel strings of batteries up to 225 Ahr each. The MK Deka batteries and the OutBack RE series are both excellent choices and can last up to 10 years in backup applications.OutBack’s integrated battery rack holds up to 3 parallel strings of their RE batteries, and is prewired with a circuit breaker for each parallel string, adding a level of safety not usually found in backup battery banks. MidNite Solar makes a variety of battery enclosures for different battery sizes and quantities. Other racks and enclosures can be found or made for a battery bank as well. For larger battery banks, the Deka Unigy II battery is available in sizes up to 2,367 Ahrs and can last up to 20 years in backup applications. Each Unigy II battery comes as a complete system with bolt together rack, cell interconnects, covers, and large termination bars. This battery bank consists of cells that are stacked on top of each other up to 6 feet high and can take up surprisingly little floor space. Flooded batteries are not recommended for backup applications for a variety of reasons. They require much more maintenance in terms of both labor and electrical consumption. Additionally, the specific siting requirements for flooded batteries often render them impractical for typical residential backup applications.